Microchipping offers cats a safe, permanent method of identification! 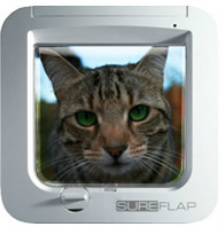 Microchips can be useful if you want the option of using a cat-flap that recognizes only your individual cat(s) and even food bowls that only allow access to the cats based on their specific chip number. What is a microchip made of and how does it work? A microchip is made up of a tiny capsule containing a minute little circuit and metal coil. The capsule itself is made of a type of bioglass (a strong, stable substance used in implants in humans). Rest assured that the circuit inside is inactive. It uses a technology called radio-frequency identification (RFID). This means that the chip is "asleep" and responds only when it is "asked" to by the radiowaves emitted from a microchip scanner. ​Each microchip contains a 15 digit number that is unique to your pet. This number is stored securely on a national database. A scan of the chip reveals your name and address from the database's records. Does a microchip need any maintenance? Are microchips safe - will it hurt my cat? The brand I use has been making microchips since the 1980s and was set up by a vet. They are used by other vets the world over and implanted in cats, dogs, rabbits, reptiles and used in zoos too. I use the mini-microchip that has been especially designed for smaller animals like cats. It is 8mm in size rather than the bigger 12mm sizes that some practices use - it means a shorter, thinner needle can be used for implantation which tends to hurt less. The microchip placing procedure is usually very simple and is only slightly more painful than a normal vaccination injection. A cat will not be aware of the microchip's presence once it has been implanted. It usually remains within the loose, soft connective tissues under the cat's "scruff" (the skin between the neck and shoulder blades). When placed correctly, a microchip is so close to the surface of the body that sometimes you may even be able to feel it under the skin with your fingertip. Very occasionally microchips can migrate from the site of implantation but this is not unsafe, more an inconvenience. I tend to think of the analogy of the chip moving between a mattress and a fitted sheet, rather than going into the mattress itself as many owners fear. The only time I have heard of a microchip going anywhere other than in this safe plane is at the time of implantation when it has been inserted wrongly by someone other than a vet. Remember a microchip is only ever as good as you are at remembering to keep your contact details up to date! You should always prioritise changing your microchip details if you move house, change phone number or email address. You can do this simply by contacting your microchip database – find the phone number on your microchip paperwork or visit the Petlog website for further advice. Does my indoor only cat need a microchip? Absolutely YES!! Indoor only cats need to be identified just as much as those that routinely go outdoors. You may never intend to let your cat outdoors but throughout my career I can think of countless 100% indoor cats that I have encountered that have escaped for one reason or another. You may be very careful but accidents do happen and when they do, these cats are particularly vulnerable as they are likely to either hide in a dark quiet spot (eg inside an open delivery van, inside someone's shed etc) or flee the scene and end up wandering scared and alone. Without any permanent identification it makes the safe return of your cat much less likely- especially if they get injured and arrive at a vet clinic that is outside your local area,. (eg afterhours emergency centre). Lost cats often turn up at opposite ends of the UK from where they went missing so a microchip ensures a point of contact wherever you cat is found. I don't think anyone can honestly convince me that their indoor cat could not ever escape ... through an open window, a door blown open in the wind, a door left ajar by a careless trades person or just through plain old human error? Add to that, the fear that things like building works, fireworks, visitors, young children or an unavoidable trip to the vet can cause and there are plenty of opportunities for your cat to inadvertently end up lost in the outdoor world. Want your cat microchipped at home?